Hello everyone, today we will talk on a very interesting and interesting topic, in this article I will tell you how to make money on an iPhone or iPad (this method is also suitable for owners of mobile devices based on the Android operating system). We will consider a way to make money on your mobile gadget using the service of paid installation of mobile applications on your iPhone or iPad mobile gadgets.. The service is called GoAppCash. There are a lot of rumors about this service on the Internet, a lot of good, a lot of bad. In general, opinions are ambiguous and it is difficult to draw from them more or less objective. But, we will test this service on ourselves and draw conclusions, we will be on our own experience. So, proceed to the lesson. 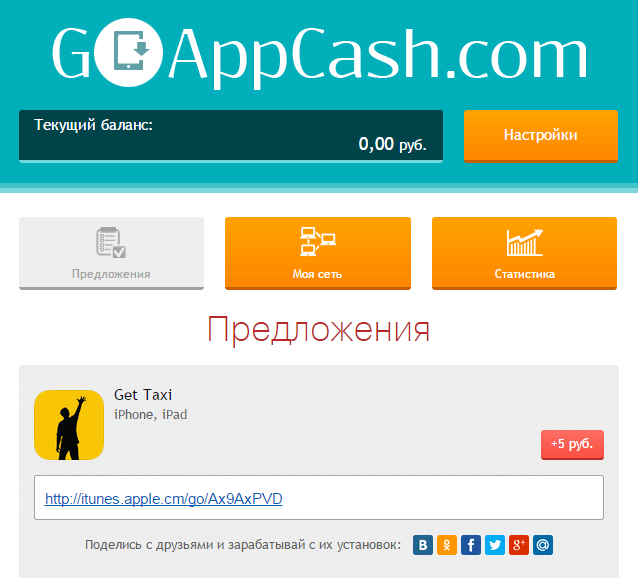 So let's get down to the lesson and register with GoAppCash.. Let me remind you that the service is suitable for both iPhone mobile phones, iPad tablet computers, and mobile devices based on the Android operating system. Follow this link - link - then find the big yellow button "My Account" and click it. Next, you need to enter the phone number to which the activation link will come. In the list, check the box next to the iPhone or iPad. So that the system selects applications optimized for your mobile gadget. On your phone that you specified in the previous step, you will receive messages with a link to activate your account. All, the registration process is completed, it remains only to start installing applications for money and displays them on their e-wallets. Log in to your GoAppCash account from your iPhone, iPad or Android mobile device. On the page that opens, select the "Applications" tab. You will see a list of the application to install, to the right of the application name you will see the amount of money you receive after installing the application. Under the name of the application you can find the link, click on this link and install the application. Let me remind you that clicking on the suggested link is recommended directly from your iPhone or iPad mobile device. Thus, occasionally installing applications for money on your iPhone or iPad, you can earn a little money for whatever small needs, for example, to pay your mobile phone bill. Today, this is all, I hope this small note highlighted the topic of earnings on the iPhone or iPad.. I would be grateful if you share a link to this material on social networks and leave a comment below. In order to leave a comment, use the comment form below. In order to be able to leave comments you need to log in to your account Vkontakte.